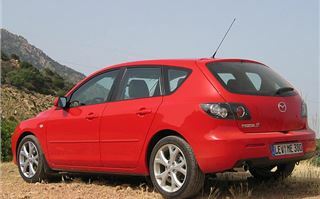 The Mazda 3 has been given a discreet facelift and a general tweaking. Nothing hugely significant. 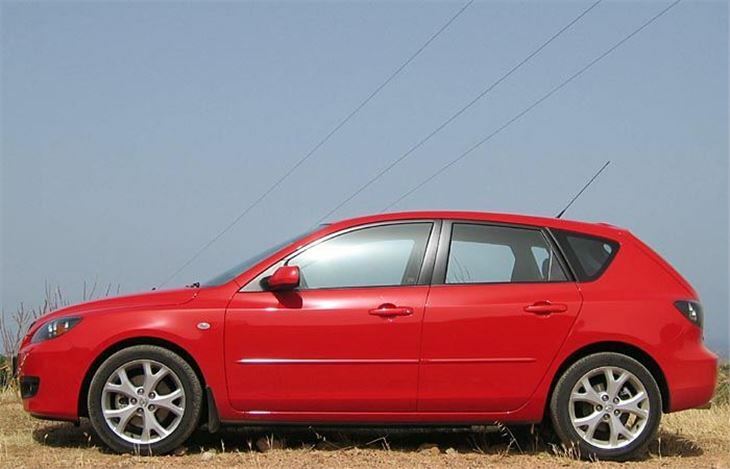 Merely a good car made better using lessons learned on the Volvo S40/V40 and Ford Focus with which it shares its floorpan, suspension and drivetrain. 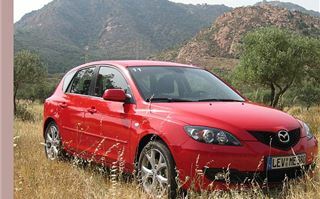 The Mazda 3 was the second car after the C-Max on Ford’s C1 platform, preceding the Volvo S40/V50 and the Focus itself. So the new version benefits from three years of lessons learned with the shared technology. 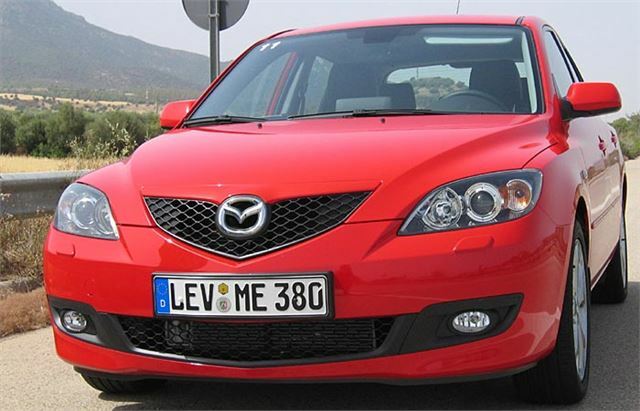 Outside, the Mazda logo in the grille is slightly bigger. The rather ugly optional slatted grille has been abandoned. The front bumper is restyled. The alloy wheels are a new design. There are some new colours: Carbon Grey mica, Phantom Blue mica, Aurora Blue and Icy Blue mica. (Happily, the best old colour, a very rich solid red, has been kept.) And there’s an extra diesel: the 90PS version of the Ford/PSA 1.6 offering combined economy of over 60mpg. Under the skin, suspension settings have been altered slightly to make the car more responsive, improve ride quality and refinement and reduce noise levels. Other improvement include a keyless card entry system and cruise control on high spec models, an optional 7 speaker Bose sound system and an optional 20GB hard drive sound system capable of storing around 3,000 music tracks. All models offer slightly improved fuel economy at the expense of around a tenth of a second off their 0-60 acceleration times. 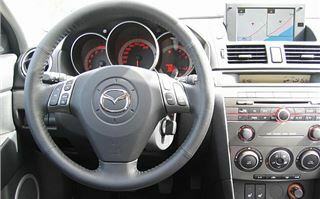 The 2.0 now has a 6-speed box rather than a 5-speeded and the 1.6 4-speed automatic box has also been slightly improved. As before, you can have a five-door hatchback or a four-door saloon for the same money, though prices are now up by between £500 and £830. And early in 2007 we’ll see a fire-breathing 155mph 250PS MPS version. Even though the Focus is built in Germany and Spain, the Volvos in Belgium and the Mazda 3 in Japan, their platforms share “40% commonality of parts”. They’re tough, they’re stiff, they resist side impacts well and they carry proper fully independent suspension with multi links, compact coil springs and ‘control blade’ radius arms at the rear. Apparently this system frees the rear dampers to damp more effectively than they could with a spring around them. 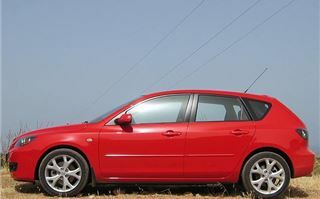 As well as looking great outside, the Mazda 3 is nice inside, with bags of head and legroom front and back. The dash is pleasant to behold, with easy to operate controls. The optional satnav is DVD, so carries much more information than a CD based system. The radio has a single CD player. The air-conditioned glovebox is so deep most of your arm disappears inside it reaching to the bottom. The doorpockets have built-in bottle holders. There’s a combined can/bottle holder or oddments bin next to the handbrake lever. And, the armrest cubby between the seats is split-level. So there’s somewhere for everything. The steering wheel adjusts up and down or in and out. The driver’s seat has height adjustment. And, very sensibly, the driver’s seat rake adjustment is by wheel so you can get it just right, while the passenger gets a seduction seat which can instantly reclined. hydraulic steering on the 2.0 has a bit more ‘feel’ than before, and the car now benefits from a 6-speed transmission. And its new electronic throttle and new sequential valve timing mean the engine reaches peak torque 500rpm earlier, which makes it more flexible and more amenable to block changing (3rd to 5th, 4th to 6thm etc.) But the most obvious choice is the 1.6 diesel. It’s quick enough, pleasantly flexible, doesn’t give you anxious moments waiting for the torque to come in on roundabouts and grips, steers and handles very well indeed. 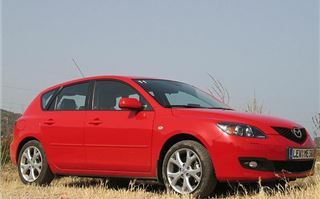 And Mazda has waved a magic wand over the ride quality. On the sometimes rough and pock-marked test route it soaked up everything the road could fling at it. However, one strange thing happened. In both cars at about 100mph a noise cut in. Not a warning buzzer. Not a police car behind us. 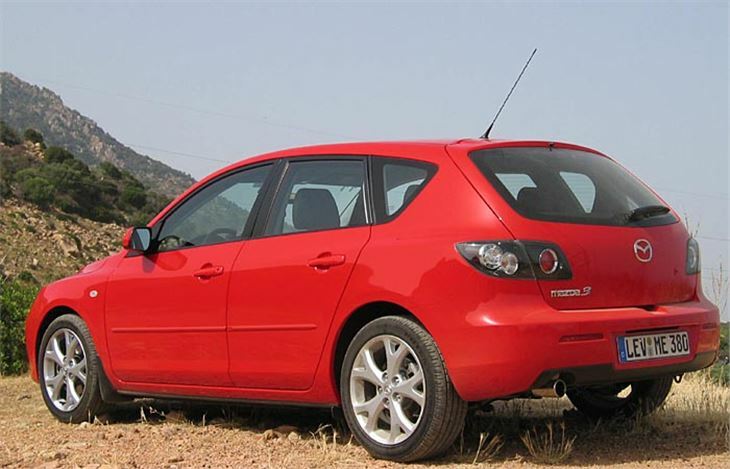 Discussions with Mazda engineers concluded that the tyres and road surface must have been the culprits. Very odd, but consistent between two completely different cars. Not that it’s going to bother UK customers much. In the pecking order and status stakes, the Mazda 3 fits between the Focus (because it’s a Ford) and the S40/V50 (because they’re Volvos). 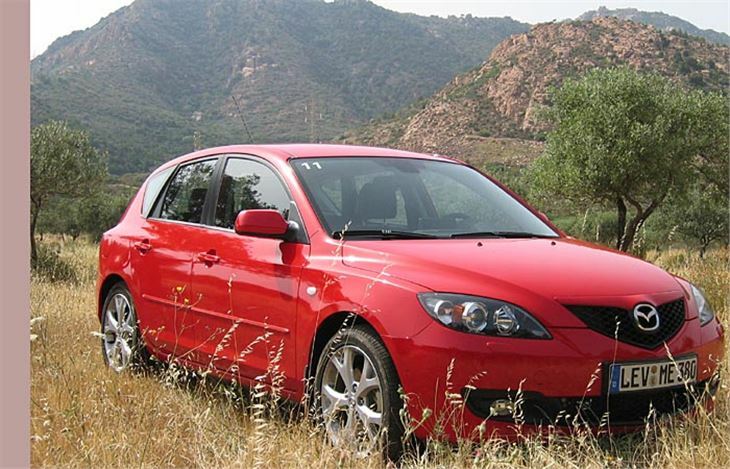 It sells on looks and the fact it’s a Japanese-built Mazda with a very impressive reliability record. 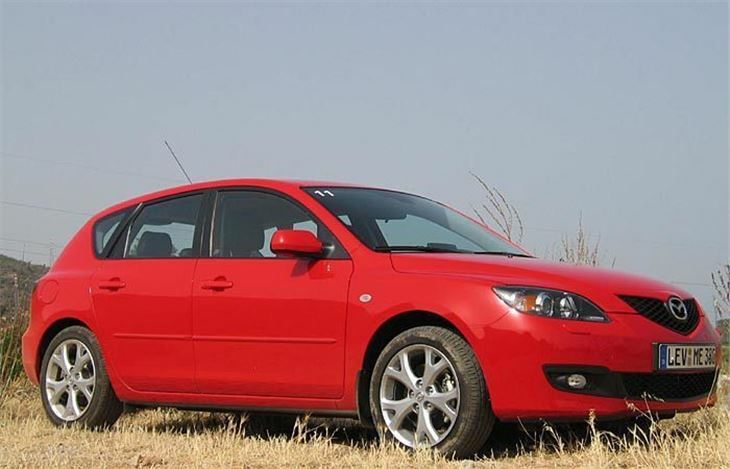 Buy it for its looks, its ride comfort and its reliability and you won’t be disappointed.